Hello dear readers! Today I’ve put together 10 short principles that I use as a guide to help me learn languages effectively. It’s a short and easy read, and I think the advice given here can be of great use to many of you. Read and re-read these principles as often as you need; I’d even encourage you to copy and past them in a Word document and print them out and have them near your desk as a reference. Anybody can be successful at learning a language with the right mindset, the right attitude, and the right method. In order to learn a language, you need to be calm and relaxed. Stress hinders the brain from efficiently absorbing and retaining information. You can speak the language you are learning. You are confident when you talk and you know you are making progress. Tracking the progress you make gives you additional confidence and satisfaction. Mistakes are fantastic opportunities to learn. The greatest mistake we make when learning a language is living in constant fear that we will make one. Learning a language needs to be a pleasant experience. By enjoying learning, your brain (and therefore your memory) works much better and is able to retain more information, more efficiently. Reaching fluency in a language is 50% confidence, 50% attitude (including your motivation). Lack of confidence is one of the major reasons why people struggle so much in speaking a foreign language. If you want to become a fluent speaker, you need to let yourself go and not think when you speak. The more you think about grammar and rules when speaking a language, the less fluent you will be. You have to learn to forget about rules once you learn them. Anything you really enjoy doing in your native tongue, you can also enjoy doing it in the language you are learning. This can be reading a book, reading blogs, playing computer games, meeting friends, listening to music, etc. Learning a language should not be seen as “homework,” but rather as an enjoyable process to reach a personal goal.But keep in mind that reaching a goal requires a lot of time and effort! 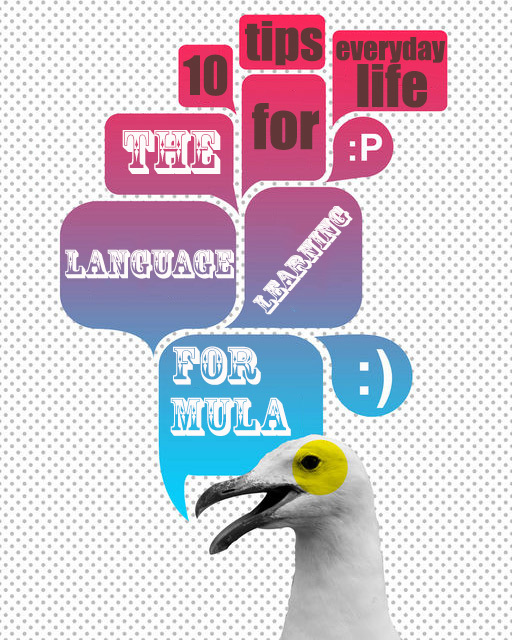 It is of crucial importance to enjoy learning a language with material suitable with your level. If what you are using is too hard for your level, you will lose confidence and interest. If something is too hard for you, you should look for something you can more easily manage. If you wish to speak a foreign language well, then you need to SPEAK IT!! Speak, speak, speak. Repetition and practice will inevitably bear fruit and you will see your speaking dramatically improve as long as you make the effort of speaking as much as possible. You can speak to yourself anytime of the day! By using the language and having a desire to communicate a message, words will also stick in your memory incredibly better. That’s it for today folks! Let me know what you think, it’s always a great pleasure to hear from your experiences and to see what works and what doesn’t work for you. We can all learn from each other! Hi Sam ! Thanks for those general tips that every language learner should stick to their walls. Surely you want to mean “You can speak to YOURSELF anytime of the day!” in tip 10. Anyway keep up the good work ! you’re a great inspiration to me ! Everyone often says that it’s a good idea do speak the words that you are learning in order to reinforce them in your memory. However once we get into an upper intermediate level it can often be quite difficult to find a position to just pop one of our recently learned words into the conversation. When you are this level how do you just find spaces to use these less common words? I also often have imaginary conversations with myself in my target language. I think about situations in my daily life and imagine what I and the person I am talking to would say. I find it’s quite helpful. Indeed, when you get to an intermediate/upper-intermediate level, it gets hard to actually use the vocabulary you’re acquiring because it can get more complex and specific, and thus less common. This is the difference between active and passive vocabulary. I am actually planning to write a post about this, so I’ll get more into the details later on. But the basic idea is that of course passive vocabulary is, by its nature, not used in everyday conversations. This is vocabulary that you acquire through exposure and that you understand, but that you have difficulty using yourself (or that is simply not common enough to be used in the spoken language). So in these cases of course the only way to “maintain” your passive vocabulary (i.e. to remember those uncommon words you come across) is simply through exposure, by reading and listening as much as you can. Another way would be to make videos of yourself (or even imaginary conversations) talking about more specific topics, and forcing yourself to use more technical vocabulary. It’s all about repetition, really. Exactly! I spend several hours a day “studying” Spanish, but really I’m just reading books and watching movies. Sure, it’s more difficult than it would be in English and my comprehension isn’t as good, but it’s mostly a lot of fun. And when I speak with conversation partners we just have fun talking about things that interest both of us. No grueling study necessary, at least not at this stage. Well put Samuel! It’s not always easy to learn a language using only material that really engages you, but it certainly is possible to do it the majority of the time, especially once you reach an A2 or B1 level. And since language acquisition is an unconscious process, the beautiful thing with this way of learning is that you are not even aware that you are actually learning a lot. It’s only with the benefit of hindsight, when you look back at the progress you’ve made, that you realize just how better you have gotten at your target language. I’ve seen some videos of polyglots showing they are learning many others languages at a basic/intermediate level, in addition to main languages ​​that they know. Expecially making use of courses as Assimil and the like. It seems as if they get satisfaction by going to buy the sequel of a best seller book by a famous writer. I would like to ask what benefits you obtein by get used to being in a starting situation in more languages ​​(over months or years) compared instead with the decision to limit your commitment to a smaller amount of foreign languages, but with higher ambitions with respect to the level at which you want to bring those few languages. In other words: it is more challenging for the brain the fact of put ourself into the path of words’s acquisition, toward learning more sophisticated cases or structures of a few languages, or instead more benefits can be achieved by a very varied diet, by tasting many languages alongside few favorite ones​​? People learn languages for different reasons and set different goals for themselves. Some people really enjoy learning a language up to a high beginner or intermediate level and then switch to another one. Moses McCormick is a good example of this type of people; he has studied over 50 languages, mostly to an intermediate level. Others spend 5 or 10 years learning only one language up to a very high level. Whether one way or another will bring more benefits is entirely dependent on your goals. Obviously, if your goal is to become a professional translator, learning 10 languages up to a B1 level won’t do you any good. But if you are looking at meeting new people, expanding your horizons, learning about the world and about different cultures, then you might find that learning several languages to a lower level brings you more benefits than focusing all of your efforts on only one. The reason why some people choose to go through, say, several Assimil books is for the simple fact that they really enjoy the method (as I do), and so it would not really make any sense to learn another language using a different method if that particular one (Assimil in this case) is the most suitable for one’s learning style. Perhaps the most challenging aspect of learning only one language for many years is the motivation part. You have to keep going and not give up, and constantly try hard to become better. It’s easy to become complacent with your current level, and thus easy to lose the motivation necessary to achieve a very high level of proficiency in a given language. On the other hand, after you reach a high-intermediate level in a language it’s less about “studying” and more about “enjoying” the language. At this stage you can pretty much start doing whatever you enjoy doing but in your target language.